5th Electrific Meeting in Prague! Partners of the 5th Electrific Meeting in Prague. 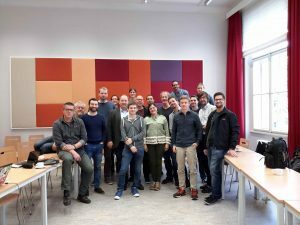 From 25th to 27th September, 2018, took place the 5th Electrific Meeting at the Czech Technical University in Prague. All the project’s partners had a great chance to share different trials’ results on electric vehicles (in Germany), e-bikes (Sumava Park, Czech Republic) and e-buses (in Spain, fleet of TMB, Metropolitan Transports of Barcelona). Furthermore, they were also presented the last advances on an app’s prototype that will allow to get the most ecological, fastest and cheapest routes for e-cars.